Ismael Hernandez was the most recent fatal victim of police and military violence in Honduras. The 40-year-old man was killed Feb. 5 in Choloma, about 200 kilometers north of the country’s capital. According to eyewitnesses and national human rights organizations, Honduran security forces launched tear gas and opened fire with live bullets at protesters, who continue to reject President Juan Orlando Hernandez’s highly questioned re-election. The same day, hundreds more Hondurans were injured as police cracked down on the university students’ movement protesting as classes resumed at the National Autonomous University of Honduras in Tegucigalpa. 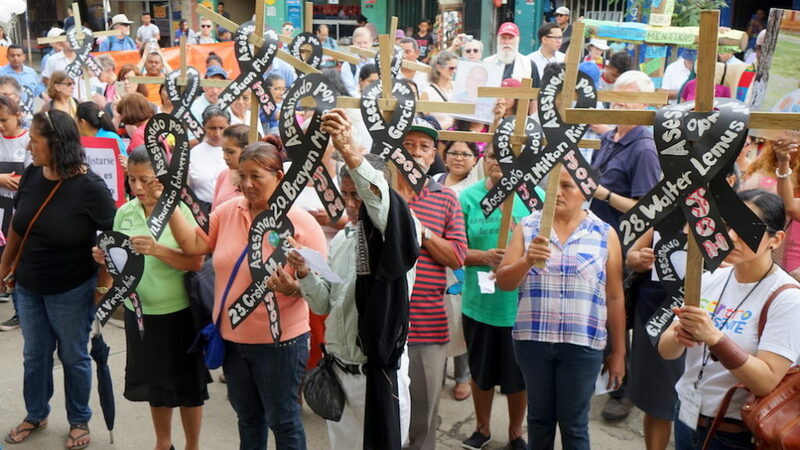 In less than a week in Honduras accompanying Radio Progreso, a critical alternative media outlet, I witnessed three illegal detentions, police using the political context of fear and intimidation to loot possessions of value, and the use excessive force. In one instance, more than 200 military and police agents launched more than 50 tear gas canisters at a group of less than 40 people to forcibly disperse the unarmed demonstrators. I was with a former member of Congress whose home was ransacked and family members threatened with guns to their head by uniformed police. I heard testimony from a 35 year old mother of five, who recounted that two days earlier, uniformed military and police agents dragged her husband, Geovany Dias, out of bed in the middle of the night and shot him 40 times. The state agents are accused by locals of being part of a death squad wreaking havoc and killing organized famers nearby. The man hadn’t been part of the demonstrations against Hernandez, but the message from the state security forces that left him on the side of the road for everyone to see was clear: anyone could be next. This is state-led terrorism in Honduras, and the Canadian government is supporting it. Late on Dec. 22, 2017, the Canadian Embassy in Honduras threw its support behind Hernandez, recognizing his highly contested election win in a tweet. The Honduran president, who ran for a second term in office on the Nov. 26, 2017 ballot despite a constitutional ban on re-election, came out as the victor after three weeks of behind-closed-doors ballet counting and widespread allegations of fraud that prompted hundreds of thousands of Hondurans to take to the streets. In its message, the Canadian Embassy called on the Honduran government, which had already declared a 10-day military curfew and continued violently repressing opposition protesters, to respect human rights and ensure those responsible for the violence were held accountable. Seven weeks later, Hondurans continue to bear the brunt of heavily militarized government repression, tacitly supported by funding from Canadian taxpayers. Honduras is home to Canada’s largest bilateral development program in Central America, and Ottawa offers significant contributions to strengthen security institutions in the country despite a poor human rights record. Since the election, more than 35 people have been killed, mostly at the hands of state security forces, and hundreds more have been detained. Meanwhile, Canadian companies, mostly in garment manufacturing and mining, have reaped major profits in Honduras since the 2009 U.S. and Canada-backed military coup, thanks in part to a free trade agreement ratified in 2014 and behind-the-scenes political support to ensure favorable changes to the Honduran mining law in 2012. Amid the deepening crisis, on Jan. 19, Honduran police detained Edwin Espinal, sending him to a maximum security military prison on the eve of a week-long nationwide strike. He faces charges related to arson, property damage and use of homemade explosive material. According to a blog dedicated to the release of Espinal, he is also under investigation for terrorism and criminal association related to damages to the Marriott Hotel during a Jan. 12 protest in Tegucigalpa. Espinal is a recognized human rights and resistance activist who has participated in pro-democracy movements since the 2009 military coup. Since being incarcerated, except for a brief visit by his lawyers, Espinal has been denied contact with family, journalists and international human rights organizations. The conditions of his detention — and that of the dozens of others illegally detained on trumped up charges — are unknown. 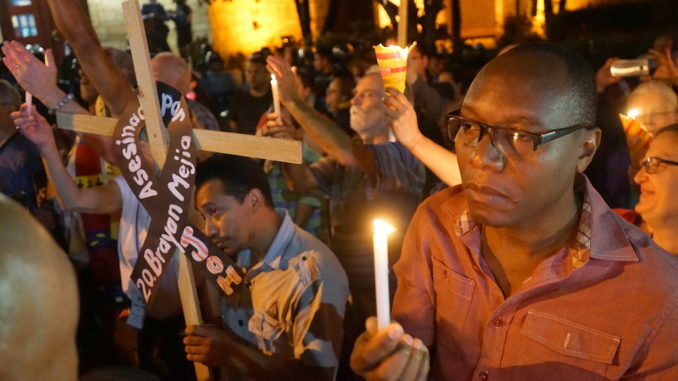 Espinal’s partner, a Canadian human rights expert and activist who has spent the better part of the last 10 years working in Honduras, and other supporters have urged the Canadian government to speak out regarding the case. Despite touting strong political and diplomatic ties with Honduras, Canada has failed to act in Espinal’s case — and the cases of others in situations like his — by not condemning the systemic and ongoing human rights crisis in Honduras. The same day Espinal was incarcerated, the Canadian government issued an alert to Canadians to “Exercise a high degree of caution in Honduras due to violent demonstrations.” In a country where the army and police are armed to the teeth — due in part to Canadian government funding — and have shown little restraint when attacking citizens in the name of protecting elite economic and political interests, it’s time for Canada to condemn the real perpetrators of violence. It’s time to demand the freedom of all political prisoners, like Edwin Espinal, being held without cause by the Honduran government. It’s time to stop quietly supporting a fraudulent government through economic aid, military training and private investment that is allowing the Honduran state to train death squads to act against its people. Ottawa’s response to Honduras’ 2017 election was eerily similar to its response to the 2009 coup d’etat in Honduras, when then-Minister of State Peter Kent called for a peaceful resolution to the “political crisis.” Bob Rae, then-Liberal foreign affairs critic, said that Canada should suspend military aid and training of Honduran soldiers. In the wake of the Nov. 26 election, Canada has similarly called for dialogue, but failed to condemn grave violations of human rights at the hands of Honduran state forces, continuing tacit support for a repressive government. It’s time for Canada to rectify its dangerous diplomacy toward Honduras and this time, not through a tweet, but through real action that will allow true democracy and freedom of expression in Honduras.